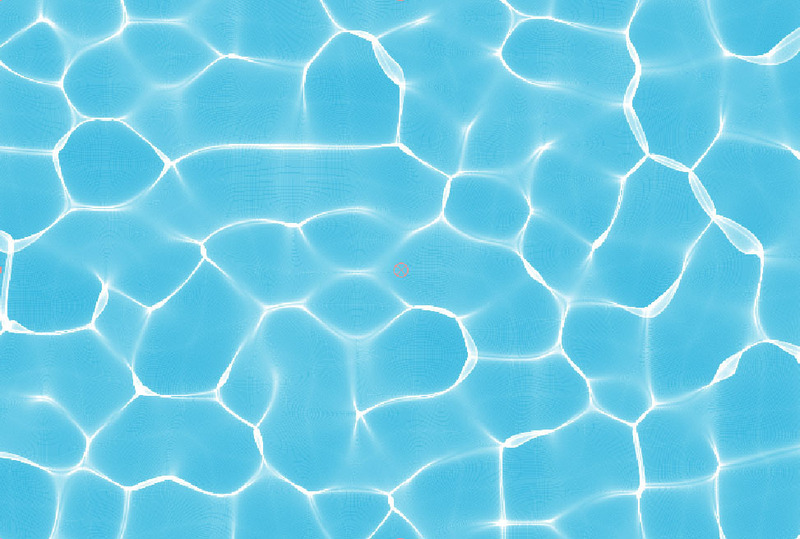 The BCC Caustics ﬁlter can be used to simulate the effect of light refracting through a surface of water and projected onto a surface (like moving water ripple reﬂections on a pool bottom). You can use this ﬁlter to create many types of effects where rays emanate from a point and are reﬂected or refracted by a curved surface. 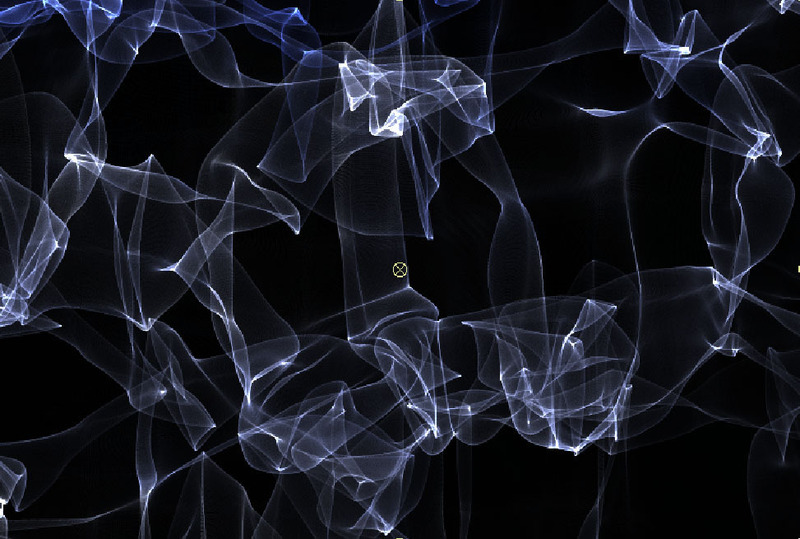 For example, you could use this ﬁlter to generate moving plasma ﬁelds, smoky particle effects, waves in a pool, or animating geometric patterns. Warning: This ﬁlter is very render intensive. You may want to work in draft mode while you set up the effect. Then deselect this checkbox off to ﬁnetune your effect. The View menu is a preview display. You can display the Final Output, the pattern (or layer) used in the Wave Source menu to create the Waves or the Color used in the Color Source menu. The Compositing menu controls how the texture is composited over the source image. Choosing None composites the ﬁlter over a color background and ignores the ﬁltered clip. The remaining choices are Apply Modes. For descriptions of all the possible Apply Modes, Click Here. The Wave Source menu is used to set and view the input source for the waves generator. Filtered Layer uses a channel (luma/brightness/alpha/red/green/blue) from the layer to which the ﬁlter was applied as a source for the caustics wave generator. Aux Layer uses a user speciﬁed layer from the timeline as the source for the caustics wave generator. You set the Aux Layer in the Aux Layer menu. Fractals uses a built-in fractal generator algorithm as a source for the caustics wave generator. The Color Source menu sets the color of the generated caustics. Color Control uses the speciﬁed Color parameter. Filtered Layer uses the color(s) from the layer to which the ﬁlter has been applied as the source for the color of the generated caustics. Aux Layer uses the color(s) from a user speciﬁed layer as the source for the color of the generated caustics. You set the Aux Layer in the Aux Layer menu. The Alpha Source menu controls the alpha channel generated by the ﬁlter. Unmult Image uses the luminance of the caustics image as the alpha channel. Opaque ignores any alpha present in the layer to which the ﬁlter has been applied. Filtered Layer uses the alpha information available in the current layer, including the color used in the premultiply process. The Aux Layer menu displays a list of all layers in the current timeline. The clip chosen in this menu is used wherever Aux Layer is set as a source. The Wave Channel menu sets the source channel for the wave generator. The choices are Luminance, Brightness, Alpha, Red, Green, or Blue. If the Wave Source menu is set to Fractals, this parameter has no affect. Wave Smoothing controls the amount of blur that is applied to the wave map. Increasing values results in a more blurred wave map. This option enhances the caustics image as 8-bit image layers make very poor looking waves unless they are blurred. Wave Area Scale sets the scale of the ﬁltered layer so that the caustics completely cover the image output. If the scale is too small, the edges of the caustics image are visible in the output. Increasing values increase the scale of the layer. Projection Distance moves the screen onto which the caustics are being projected closer or further from the camera. This essentially changes the focus of the generated caustics. As you move this control, the caustic image folds over itself and spreads. Increasing values make it appear as though the projection screen is further away, making the caustics appear smaller. Color sets the color of the generated caustics when the Color Source menu is set to Color Control. Brightness adjusts the brightness of the generated caustics. Contrast adjusts the contrast of the generated caustics. Wispiness adjusts the level of detail of the generated caustics. At a value of 0, the generated caustics use a ﬁne gradient with soft edges. As the value increases, the texture appears coarser, with a rougher gradient and harder edges. Softness adds an overall blur to the caustics image, prior to its being composited (if the Compositing menu is set to something other than None). Sampling Density is a smoothing control. Increase this parameter until the generated caustics appear smooth. If this parameter is too low, a ﬁne dot pattern could appear in darker areas. Fractal Frequency controls the size of the waves from the fractal generator. Fractal Detail sets the visible level of detail in the generated caustics. Increasing values generate a more complex image. X Position sets the horizontal center of the caustics. Animating this parameter makes the ﬁeld drift across the output like ﬂowing water. Y Position sets the vertical center of the caustics. Animating this parameter makes the ﬁeld drift across the output like ﬂowing water. Mutation Rate sets the speed of the caustics as they change over time. Higher numeric values will cause the caustics to evolve more rapidly. Random Seed determines which value is input to the random number generator used by the ﬁlter. Adjust this value when you like the overall effect but want to adjust the random conﬁguration of the caustics. If you have two applications of caustics, use different values so that their output images are different.